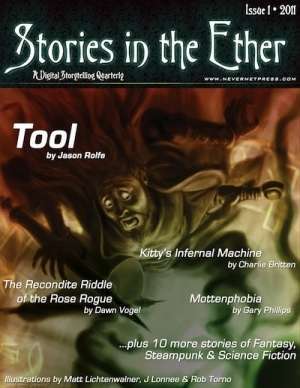 Stories in the Ether is a quarterly storytelling anthology of fantasy, steampunk, and science fiction short stories from Nevermet Press. This issue features 13 compelling works by Therese Arkenberg, David Bell, Charlie Britten, Matt Delman, Tim Kane, KA Masters, David Perlmutter, Gary Phillips, Michael Morrison, Jason Rolfe, Dawn Vogel, David Wright, and Lee Clarke Zumpe. Artwork inspired by the stories comes from Matt Lichtenwalner, J Lonnee, and Rob Torno. THIS IS THE ePUB VERSION for eReaders such as Kindle, iPads, iPhones, Nook, etc. A PDF version is available as well. This title was added to our catalog on September 24, 2011.